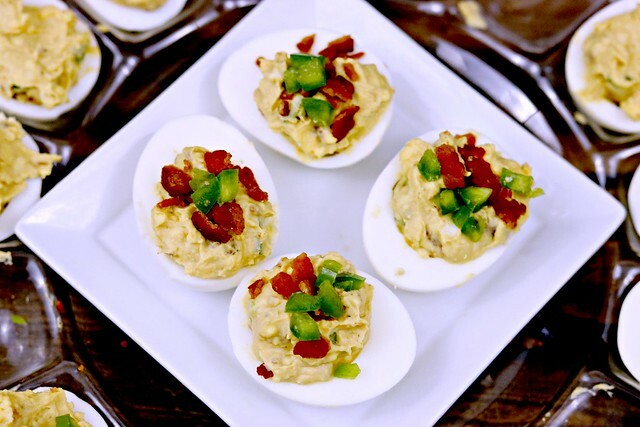 Classic deviled eggs are kicked up a notch with the addition of crispy bacon and jalapenos! Have you ever tried to make your own hard boiled eggs? Did it take you a million tries to get the timing right? Because, it is amazing how much difference one minute can make. If you’ve ever tried to peel a hard-boiled egg and wound up with a mangled mess of egg, you know exactly what I’m talking about. But once you figure out the timing, it’s easy peasy. 12 minutes. That’s the magic number. Bring the water to a boil, and boil them for 12 minutes. Then turn off the heat and let them sit for awhile before transferring to ice water. Less time and you’ll have a mess and waste a lot of eggs. More time and the yolks turn funny bluish-green colors. So just trust me. 12 minutes. 12 minutes to hard-boiled egg perfection. 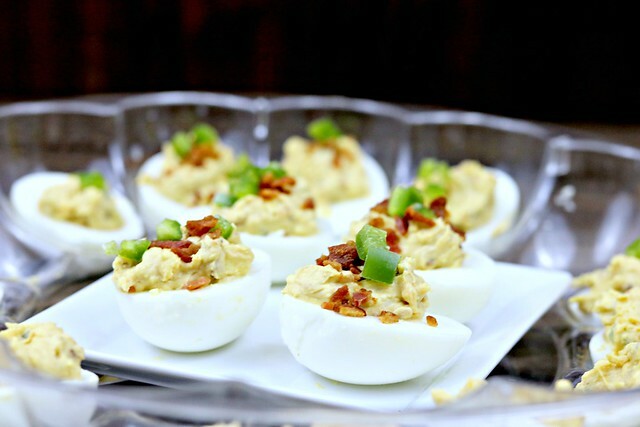 And then…these deviled eggs. Now, typically I’m kind of a deviled egg purist. I want the plain ol’ mixture with a few pickles thrown in. No onions, of course. But to replace the pickles with some diced jalapeno and crispy bacon? Yeah, I am all for that. Because the base of the mixture is still the classic taste – but now you have bacon and jalapenos. And, how could that be wrong?? For awhile now J has been mentioning that we need to have deviled eggs again, and I kept telling him that we needed a holiday or event for me to make them, because I could just make deviled eggs for no apparent reason. How silly was that mindset? And since we’ve started having our Finger Food Fridays at home, it was the perfect excuse for me to make them, without a holiday or party being involved. I mean, the bacon and jalapenos make them a well-rounded meal, right? Dairy, meat, veggie. Done. And they were super yummy. And gone in about 2 minutes. Seriously. 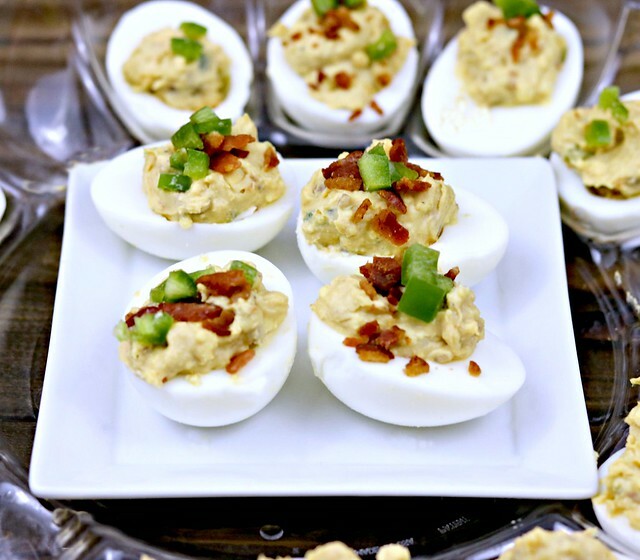 Deviled eggs really are one of those classic foods. Ones that you expect to see at Easter, Thanksgiving or Christmas gatherings. But, you don’t have to wait for a holiday or party to make these little yummies! Have your own little Finger Food Friday at home, and make these first! Place eggs in the bottom of a large pot or dutch oven. Cover with water and place over medium-high heat on the stove. Bring water to a boil, and cook for 12 minutes. (You can reduce the heat so that there is a steady boil, but it won't boil over.) Turn heat off and let sit for about 5-10 more minutes. Meanwhile, cook your bacon. I like to cut mine into smaller pieces and cook them that way. It cooks quicker that way, and less crumbling to do after the fact. Cook over medium heat in a large skillet until nice and browned and crisp. Remove to a paper towel lined plate and allow to cool. Once cool, you can roughly chop with a knife to get the pieces a little smaller, they will break apart easily. Place a large bowl in the sink and fill with ice and water. Gently move the eggs, one at a time, from the pot to the ice water. I use a slotted spoon to do this. Allow the eggs to sit for about 10 more minutes. To peel the eggs, I first gently "crack" them on the counter, then run them under cold water as I peel them. Once all are peeled and rinsed, slice each one in half, lengthwise. Now to make your filling. In a medium size bowl, add the egg yolks. You can gently squeeze the sides and the yolk should fall out, or you can use a spoon to remove it. Mash the yolks with a fork, then add the mayo, mustard, Worcestershire, hot sauce, salt and pepper. Stir to mix well. Start with 1/3 cup of the mayo and add more if you want it creamier. Now stir in the jalapenos and bacon. I reserved a bit of each of these to top the eggs with, but you can mix it all in if you'd like. Place your egg halves on a serving platter, and use a spoon to fill each hole with the mixture. Top with any reserved bacon and jalapenos, if any. And serve or refrigerate until ready to serve.